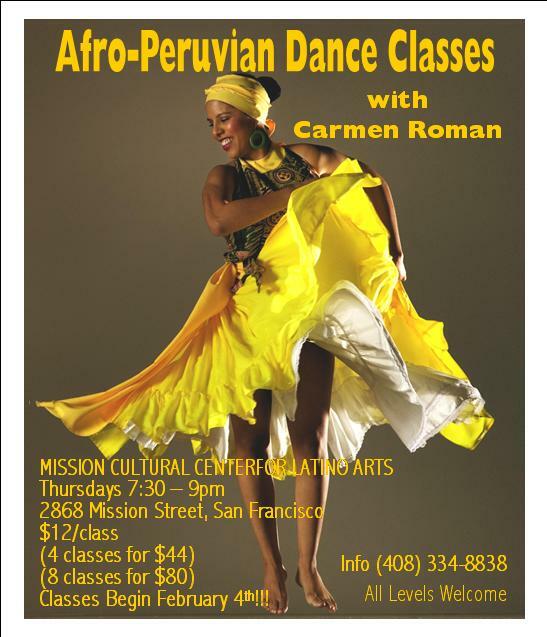 Carmen Roman is a founding member of De Rompe y Raja Cultural Association, a music and dance troupe dedicated to the promotion and preservation of Afro-Peruvian culture. She has been performing with the troupe since 1995 at various venues and festivals including SF International Arts Festival, Encuentro Del Canto Popular, and several appearances at the San Francisco Ethnic Dance Festival including the 2008 performance of Homenaje a Mis Maestros (A Tribute to the Masters) which earned an Izzie Dance Award nomination for “Outstanding Achievement in Performance”. ime in the project’s 7-year history, dance workshops for the children in the rural area of Colima. Carmen is a teacher of Afro-Peruvian dance for children and adults and is an artist in residence for Leap….imagination in learning.